The ladder-leading St. Petersburg Swans dropped their second straight, falling 1.15.10.110 – 2.11.14.100 to the resilient Tampa Bay Bombers, Saturday night at Largo Sports Complex in Largo, Florida. Clinging to a 2-point lead with less than ninety seconds left, the Swans saw their Premiership perch put in danger after a shaky midfield turnover was converted into a game-deciding dagger by a heroic Kyle Roun. Roun’s untouched, full-steam run through the corridor and emphatic major put the Bombers ahead as the clock wound down, and an errant desperation kick out from the goal line on the Swans’ last gasp iced the affair for Tampa Bay. With the win, the Bombers (2-2, 8 pts.) charge into the Top 4 on the Major League Footy 2018 Premiership ladder, while the stagnant Bloods (5-3, 20 pts.) suddenly see their margin for error slipping away. A tenacious Tampa Bay Bombers effort saw Aaron Crittenden help turn away a St. Petersburg comeback effort in the best-fought match of the season, Saturday at Largo Sports Complex in Largo, Florida. 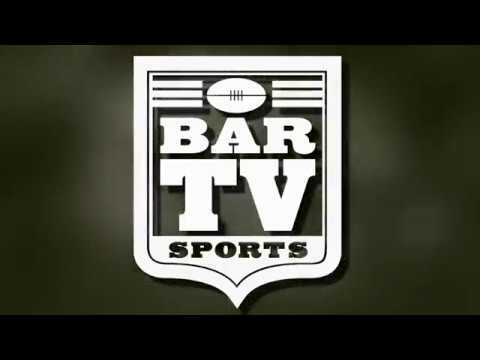 The Major League Footy schedule format sees the Bombers now presented with a real chance to rise through the run home. Tampa Bay has four games remaining on the season, while St. Petersburg has just three contests left. While any win virtually guarantees the Bloods a shot at the flag, the mid-season skid has the Red and White simply in search of a positive result. Saturday’s thriller was not without high points for St. Pete in the highest-scoring match of the season, however. 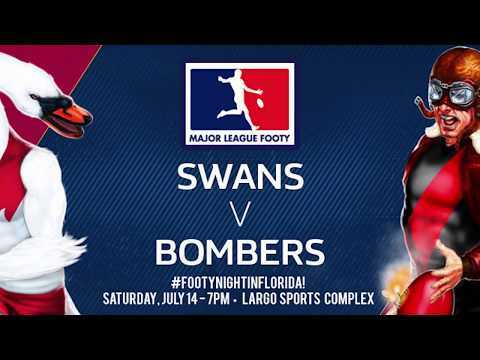 After falling behind by 12 points at the first break, the Swans steadied on defense, keeping Tampa Bay to just 17 points in the second and third frames – and controlled most of the fourth quarter play, despite an onslaught of accurate kicking by Bombers across the ground. Unfortunately for the Swans, the fourth quarter remained 15 minutes long – and it was the last minute and a half that sealed their fate. Major League Footy Week 15 action in Florida will see Starfish FC – also looking for an opening on the ladder, with seven games remaing – take on the Florida Lions in a matinee twin-bill at the Common at Crescent Lake. In the equally-contentious Western Conference, the Phoenix Scorpions (3-1, 12 pts) will look to recapture the Conference lead as their see-saw battle to the wire with the Tombstone Marshals continues. The Scorpions take on the West Side Bombers in a 10 AM MST start, Saturday, July 21 in Tempe, Arizona.